Second from right on the CD sleeve above is Helmut Schmidt, who was the Social Democratic chancellor of West Germany from 1974 to 1982. He was the fourth pianist on a 1985 Deutsche Grammophon recording of J.S. Bach's Concerto in A minor BWV 1065. 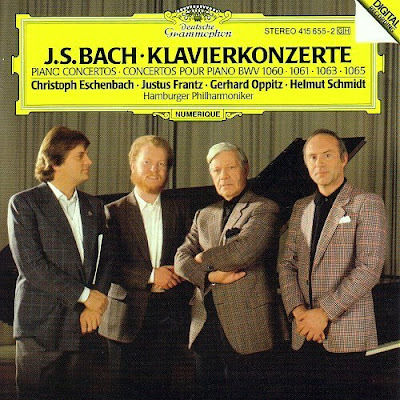 Christoph Eschenbach (a personal friend of Helmut Schmidt), Justus Franz and Gerhard Oppitz were the other pianists. It was not the German politician's first visit to the recording studio. In 1982, while still chancellor, he recorded Mozart's Concerto in F major for three pianos and orchestra, K242, also with Eschenbach and Franz, but with the London Philharmonic rather than the Hamburg orchestra, and for EMI instead of DG. Then on course there is Condoleezza Rice. While secretary of state in the George W. Bush administration she practiced keyboard diplomacy in between hunting for weapons of mass destruction. Staying in America, when Leonard Bernstein tried to mix politics and music he more than met his match in the form of 'new journalism' pioneer Tom Wolfe, whose devastating Radical Chic article was published in New York Magazine in 1970. The following year British Conservative prime minister Edward Heath chose the Helmut Schmidt way, rather than Lennie way, of mixing music with politics, and recorded Elgar with the London Symphony Orchestra for EMI; but I am afraid that one did not make it into my record collection. There is a story about Edward Heath, the conductor, which goes as follows. A professional orchestra agreed to be conducted by him in Salisbury Cathedral. Heath was never quite as good a conductor as he imagined himself to be. During rehearsals, the prime minister was growing more and more curt in his comments. Eventually, the leader of the orchestra, growing increasingly exasperated, butted in: "If you don't stop being so rude to us, Sir Edward," he said, "We may start obeying your instructions." Ted Heath may not have been a great conductor. But he did stay in office as prime minister from 1970 to 1974. The Polish pianist and composer Ignacy Paderewski (1860-1941) had a somewhat shorter innings. Appointed prime minister of Poland in January 1919, he resigned in December of the same year and returned to his career as a musician. The recordings by Helmut Schmidt and Edward Heath have long disapperared from the catalogue. But the newly released CD below contains a little known example of mixing music and politics. 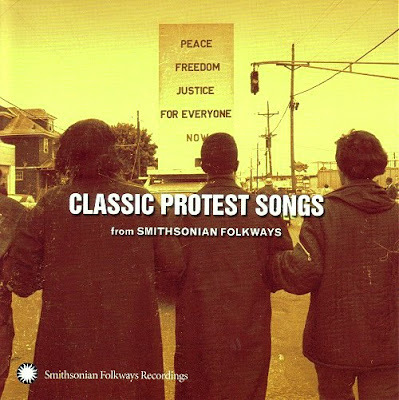 Track 20 of Smithsonian Folkways' archive compilation of classic protest songs is Gone, Gone, Gone by a group called Red Shadow. The excellent documentation with the CD tells how on the original LP release of Gone, Gone, Gone the members of Red Shadow were unidentified, but were described as a group consisting of "three Ph.D. economists and their friends from M.I.T.-land". The Smithsonian notes then reveal that one of the members of Red Shadow was Ev Ehrlich, who went on to be under secretary of commerce during the Clinton administration. The lyrics to Red Shadow's Gone, Gone, Gone, which is played to the tune of the Beach Boy's Fun, Fun, Fun, are interesting. Here is my transcription, remember they were written in 1973. But they'll be gone, gone, gone, when the people take their power away. After leaving the Clinton administration Ev Ehrlich founded ESC Company, a Washington, D.C.-based consultancy advising on economic and business problems. He was also chief economist and head of strategic planning for IT giant Unisys Corporation, and is a member of the U.S. Census Monitoring Board. 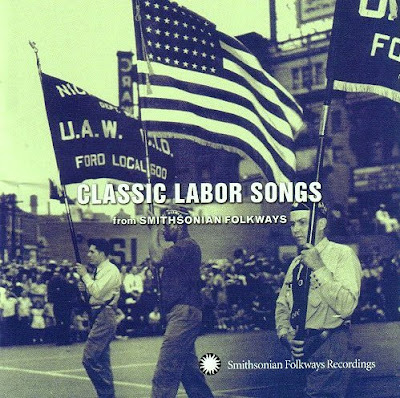 * I cannot recommend Smithsonian Folkways' Classic Protest Songs, and the companion volume Classic Labor Songs seen above, highly enough. Artists on the protest song disc include Woody Guthrie, Lead Belly, Phil Ochs, Pete Seeger, Peggy Seeger, Larry Estridge and Guy Carawan. Strange Fruit, as sung by Brother John Sellers, is one of the most convincing examples of the power of music to move that I have heard for a long time. Downloads of Smithsonian Folkways' CDs are available from their website. Individual tracks cost $0.99; download Strange Fruit and change your life - the fruit in question are the swinging bodies of lynched blacks, and download Gone, Gone, Gone and ask - when will they ever learn? Both CDs should be part of the citizenship curriculum for all schools. More examples of mixing music and politics are very welcome. Read about the first twelve tone protest song here. I had the Heath EMI recording. Cockaigne Overture. Yawn! Let us not forget Jan Masaryk, who accompanied Jarmila Novotna in a recital of Czech folk songs issued on 78 RPM records to commemorate the victims of the Nazi eradication of Lidice. Thanks for the great post and kind words about the two Smithsonian Folkways releases. Both albums are part of our "Classic" series which focuses on a theme or genre and brings together a variety of tracks from the more than 40,000 in the collection. Just FYI the full liner notes are always available for free download from the site, as are our podcasts and teaching tools. It's "They're drawing up a Federal plan"
Jon, thanks for that, and I have corrected it. I have to say that I struggled transcribing Red Shadow's lyrics, so your help is appreciated.